Discussion in 'Transformers Movie Discussion' started by Shin-Gouki, Jul 19, 2010. We have already seen iPad installed in the cars, being used in restaurants as menu cards, and how some airlines are thinking about adopting it as an inflight entertainment system for its passengers in the skies. But how about a popular movie director using iPad to direct his upcoming movie? Sounds cool isn’t it? Love him or hate him, Michael Bay is the director behind some of the most commercial hit movies of Hollywood. 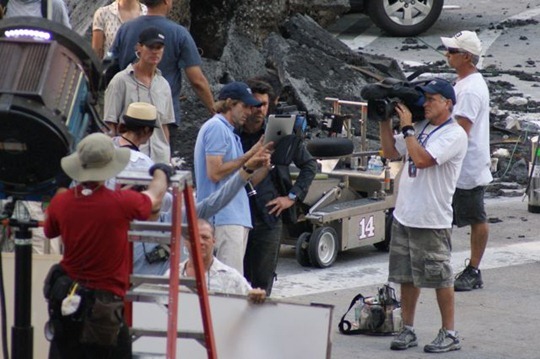 In the picture taken on the sets of Transformers 3, he is seen showing actor Patrick Dempsey how a scene is supposed to look in Transformers 3 using his iPad 3G. I that about a similar picture which i posted in the main Chicago filming topic, looks like no one noticed until now...lol! how is this really news? that be like saying michael bay wears polo brand shirt while filming and only that? I can see it being useful. Have the storyboards, animatics, or script on it so they don't have to lug around a physical copy. Of course for all we know, Bay was bragging about his high score on Frogger & had the screenshot to back-up his claim. Needless to say, Dempsey was impressed. Megan Fox, wasn't when Bay showed her...a few days later, she 'left' Transformers 3. Either that or he's saying: "Look, I got the world's most expensive beermat!" Well then... I'll be going to buy mine right now! I still want an ipad..... My girlfriends sister got one and they really are a lot of fun to play with. The typing is kind of hard but you get used to it very quickly. Probably just animatics. Spielberg did the same thing with the Iphone on Indiana Jones 4. He may direct the movie with the Ipad, but he casts the actors with his wang apparently. "yeah, I'm gonna replace the tart with another super tart, and uh...lets make it 3D since I wanna compensate". At least he's not using an Iphone 4, since then the movie would only get done when he's holding it right, or using the Ibumper. - Written by an Iphone 3G user. Eh... ok? Does it transform? What? No app for that? idk if thats a 1up for apple or a negative. I don't get on so well with the Apple brower so far. I don't have an Ipad but I do have a touch screen computer so I get some of the effect of an ipad it's useful to have sometimes I tend to touch the screen to "tweet" on the twitter website it's easier than moving the mouse to the right place to tweet. Up next: Micheal Bay uses toothbrush and Crest to brush his teeth. Ah, bay and his product placements. he is just using the gun app. you know how he is. Not surprised considering all the Apple gear scene in the first Transformers movie.